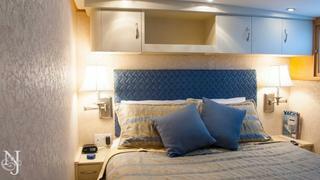 The 80- foot (24.38m) OCEAN ROMANCE features five beautiful staterooms for the comfort of 10 guests on board. 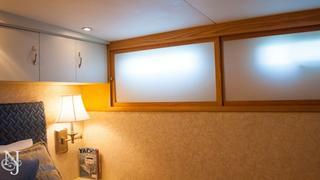 Her large owner’s quarters, forward of the lower helm, feature a living room and dining room, and an en-suite bathroom. Downstairs aft are three staterooms, including a full beam master suite with king bed and full bathroom, and two queen staterooms with bathrooms across the hallway. The forward section has a large living and dining area, a new galley, and a queen bed stateroom plus crew quarters — each with a bathroom. OCEAN ROMANCE is the largest Bertram cockpit motor yacht in the world. 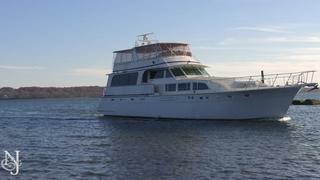 She was extended from 58 feet to 80 feet by demand of a prior owner. Thereafter, she was used successfully as a charter vessel and more recently, since 2012, as a dockside bed and breakfast yacht hotel in Newport, Rhode Island. She is rated as the number one bed and breakfast hotel in Newport by multiple vacations listing websites, and generates considerable rental income during a seven-month season. During the last five years, OCEAN ROMANCE’s interior has been upgraded to maintain her excellent condition, including a new carpet, new furniture, new countertops, and much more. 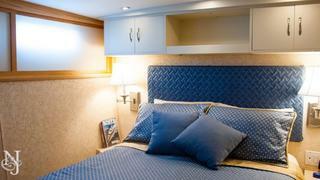 OCEAN ROMANCE offers a unique floor plan layout with a separation of areas for privacy, which is excellent for a bed and breakfast or charter yacht.